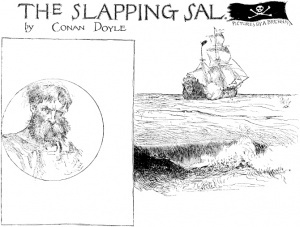 The Slapping Sal is a short story written by Arthur Conan Doyle first published in american newspapers (The Sunday Inter Ocean, Chicago, The Courier-Journal, Louisville, San Francisco Examiner) on 2 july 1893.
in The Courier-Journal, Louisville (2 july 1893 [US]) 1 ill.
in The Examiner, San Francisco (2 july 1893 [US]) 1 ill.
in The Atlanta Constitution (9 july 1893 [US]) 1 ill.
"Captain Johnson and Mr. Wharton." 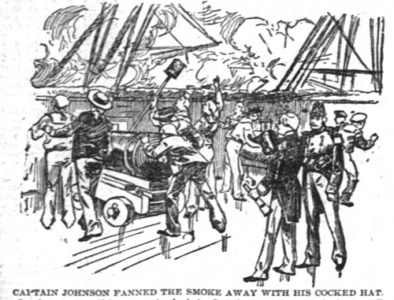 "Captain Johnson fanned the smoke away with his cocked hat." A second knocked two marines into a bloody, palpitating mash. It was in the days when France's power was already broken upon the seas, and when more of her three-deckers lay rotting in the Medway than were to be found in Brest harbour. But her frigates and corvettes still scoured the ocean, closely followed ever by those of her rival. At the uttermost ends of the earth these dainty vessels, with sweet names of girls or of flowers, mangled and shattered each other for the honour of the four yards of bunting which flapped from the end of their gaffs. It had blown hard in the night, but the wind had dropped with the dawning, and now the rising sun tinted the fringe of the storm-wrack as it dwindled into the west and glinted on the endless crests of the long, green waves. To north and south and west lay a skyline which was unbroken save by the spout of foam when two of the great Atlantic seas dashed each other into spray. To the east was a rocky island, jutting out into craggy points, with a few scattered clumps of palm trees and a pennant of mist streaming out from the bare, conical hill which capped it. A heavy surf beat upon the shore, and, at a safe distance from it, the British 32-gun frigate Leda, Captain A. P. Johnson, raised her black, glistening side upon the crest of a wave, or swooped down into an emerald valley, dipping away to the nor'ard under easy sail. On her snow-white quarter-deck stood a stiff little brown-faced man; who swept the horizon with his glass. "Mr. Wharton!" he cried, with a voice like a rusty hinge. A thin, knock-kneed officer shambled across the poop to him. "I've opened the sealed orders, Mr. Wharton." A glimmer of curiosity shone upon the meagre features of the first lieutenant. The Leda had sailed with her consort, the Dido, from Antigua the week before, and the admiral's orders had been contained in a sealed envelope. "We were to open them on reaching the deserted island of Sombriero, lying in north latitude eighteen, thirty-six, west longitude sixty-three, twenty- eight. Sombriero bore four miles to the north-east from our port-bow when the gale cleared, Mr. Wharton." The lieutenant bowed stiffly. He and the captain had been bosom friends from childhood. They had gone to school together, joined the navy together, fought again and again together, and married into each other's families, but so long as their feet were on the poop the iron discipline of the service struck all that was human out of them and left only the superior and the subordinate. Captain Johnson took from his pocket a blue paper, which crackled as he unfolded it. "The 32-gun frigates Leda and Dido (Captains A. P. Johnson and James Munro) are to cruise from the point at which these instructions are read to the mouth of the Caribbean Sea, in the hope of encountering the French frigate La Gloire (48), which has recently harassed our merchant ships in that quarter. H.M. frigates are also directed to hunt down the piratical craft known sometimes as the Slapping Sal and sometimes as the Hairy Hudson, which has plundered the British ships as per margin, inflicting barbarities upon their crews. She is a small brig, carrying ten light guns, with one twenty-four pound carronade forward. She was last seen upon the 23rd ult. to the north-east of the island of Sombriero. "(Signed) JAMES MONTGOMERY "(Rear-Admiral). "H.M.S. Colossus, Antigua." "We appear to have lost our consort," said Captain Johnson, folding up his instructions and again sweeping the horizon with his glass. "She drew away after we reefed down. It would be a pity if we met this heavy Frenchman without the Dido, Mr. Wharton. Eh?" The lieutenant twinkled and smiled. "She has eighteen-pounders on the main and twelves on the poop, sir," said the captain. "She carries four hundred to our two hundred and thirty-one. Captain de Milon is the smartest man in the French service. Oh, Bobby boy, I'd give my hopes of my flag to rub my side up against her." He turned on his heel, ashamed of his momentary lapse. "Mr. Wharton," said he, looking back sternly over his shoulder, "get those square sails shaken out and bear away a point more to the west." "A brig on the port-bow," came a voice from the forecastle. "A brig on the port-bow," said the lieutenant. The captain sprang upon the bulwarks and held on by the mizzen-shrouds, a strange little figure with flying skirts and puckered eyes. The lean lieutenant craned his neck and whispered to Smeaton, the second, while officers and men came popping up from below and clustered along the weather-rail, shading their eyes with their hands—for the tropical sun was already clear of the palm trees. 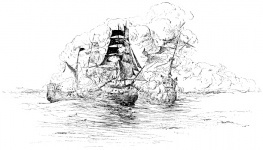 The strange brig lay at anchor in the throat of a curving estuary, and it was already obvious that she could not get out without passing under the guns of the frigate. A long, rocky point to the north of her held her in. "Keep her as she goes, Mr. Wharton," said the captain. "Hardly worth while our clearing for action, Mr. Smeaton, but the men can stand by the guns in case she tries to pass us. Cast loose the bow-chasers and send the small-arm men to the forecastle." A British crew went to its quarters in those days with the quiet serenity of men their daily routine. In a few minutes, without fuss or sound, the sailors were knotted round their guns, the marines were drawn up and leaning on their muskets, and the frigate's bowsprit pointed straight for her little victim. "Is it the Slapping Sal, sir?" "I have no doubt of it, Mr. Wharton." "They don't seem to like the look of us, sir. They've cut their cable and are clapping on sail." It was evident that the brig meant struggling for her freedom. One little patch of canvas fluttered out above another, and her people could be seen working like madmen in the rigging. She made no attempt to pass her antagonist, but headed up the estuary. The captain rubbed his hands. 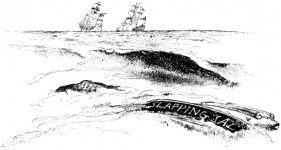 "She's making for shoal water, Mr. Wharton, and we shall have to cut her out, sir. She's a footy little brig, but I should have thought a fore-and-after would have been more handy." "It was a mutiny, sir." "Yes, sir, I heard of it at Manilla: a bad business, sir. Captain and two mates murdered. This Hudson, or Hairy Hudson as they call him, led the mutiny. He's a Londoner, sir, and a cruel villain as ever walked." "His next walk will be to Execution Dock, Mr. Wharton. She seems heavily manned. I wish I could take twenty topmen out of her, but that would be enough to corrupt the crew of the ark, Mr. Wharton." Both officers were looking through their glasses at the brig. Suddenly the lieutenant showed his teeth in a grin, while the captain flushed a deeper red. "That's Hairy Hudson on the after-rail, sir." "The low, impertinent blackguard! He'll play some other antics before we are done with him. Could you reach him with the long eighteen, Mr. Smeaton?" "Another cable length will do it, sir." The brig yawed as they spoke, and as she came round a spurt of smoke whiffed out from her quarter. It was a pure piece, of bravado, for the gun could scarce carry half-way. Then with a jaunty swing the little ship came into the wind again, and shot round a fresh curve in the winding channel. "The water's shoaling rapidly, sir," repeated the second lieutenant. "There's six fathoms by the chart." "Four by the lead, sir." "When we clear this point we shall see how we lie. Ha! I thought as much Lay her to, Mr. Wharton. Now we have got her at our mercy." The frigate was quite out of sight of the sea now at the head of this river-like estuary. As she came round the curve the two shores were seen to converge at a point about a mile distant. In the angle, as near shore as she could get, the brig was lying with her broadside towards her pursuer and a wisp of black cloth streaming from her mizzen. The lean lieutenant, who had reappeared upon deck with a cutlass strapped to his side and two pistols rammed into his belt, peered curiously at the ensign. "Is it the Jolly Roger, sir?" he asked. But the captain was furious. 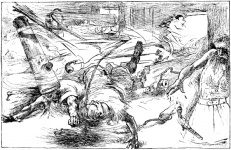 "He may hang where his breeches are hanging before I have done with him!" said he. "What boats will you want, Mr. Wharton?" "We should do it with the launch and the jolly-boat." "Take four and make a clean job of it. Pipe away the crews at once, and I'll work her in and help you with the long eighteens." With a rattle of ropes and a creaking of blocks the four boats splashed into the water. Their crews clustered thickly into them: bare-footed sailors, stolid marines, laughing middies,' and in the sheets of each the senior officers with their stern schoolmaster faces. The captain, his elbows on the binnacle, still watched the distant brig. Her crew were tricing up the boarding- netting, dragging round the starboard guns, knocking new portholes for them, and making every preparation for a desperate resistance. In the thick of it all a huge man, bearded to the eyes, with a red nightcap upon his head, was straining and stooping and hauling. 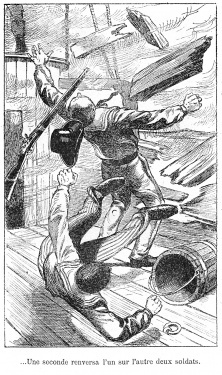 The captain watched him with a sour smile, and then snapping up his glass he turned upon his heel. For an instant he stood staring. "Call back the boats!" he cried in his thin, creaking voice. "Clear away for action there! Cast loose those main-deck guns. Brace back the yards, Mr. Smeaton, and stand by to go about when she has weight enough." Round the curve of the estuary was coming a huge vessel. Her great yellow bowsprit and white-winged figure-head were jutting out from the cluster of palm trees, while high above them towered three immense masts with the tricolour flag floating superbly from the mizzen. Round she came, the deep-blue water creaming under her fore foot, until her long, curving, black side, her line of shining copper beneath and of snow-white hammocks above, and the thick clusters of men who peered over her bulwarks were all in full view. Her lower yards were slung, her ports triced up, and her guns run out all ready for action. Lying behind one of the promontories of the island, the lookout men of the Gloireupon the shore had seen the cul de sac into which the British frigate was headed, so that Captain de Milon had served the Leda as Captain Johnson had the Slapping Sal. But the splendid discipline of the British service was at its best in such a crisis. The boats flew back; their crews clustered aboard, they were swung up at the davits and the fall-ropes made fast. Hammocks were brought up and stowed, bulkheads sent down, ports and magazines opened, the fires put out in the galley, and the drums beat to quarters. Swarms of men set the head-sails and brought the frigate round, while the gun-crews threw off their jackets and shirts, tightened their belts, and ran out their eighteen-pounders, peering through the open port-holes at the stately Frenchman. The wind was very light. Hardly a ripple showed itself upon the clear blue water, but the sails blew gently out as the breeze came over the wooded banks. The Frenchman had gone about also, and both ships were now heading slowly for the sea under fore-and- aft canvas, the Gloire a hundred yards in advance. She luffed up to cross the Leda's bows, but the British ship came round also, and the two rippled slowly on in such a silence that the ringing of ramrods as the French marines drove home their charges clanged quite loudly upon the ear. "Not much sea-room, Mr. Wharton," remarked the captain. "I have fought actions in less, sir." "We must keep our distance and trust to our gunnery. She is very heavily manned, and if she got alongside we might find ourselves in trouble." "I see the shakos of soldiers aboard of her." "Two companies of light infantry from Martinique. Now we have her! Hard-a- port, and let her have it as we cross her stern!" The keen eye of the little commander had seen the surface ripple, which told of a passing breeze. He had used it to dart across the big Frenchman and to rake her with every gun as he passed. But, once past her, the Leda had to come back into the wind to keep out of shoal water. The manoeuvre brought her on to the starboard side of the Frenchman, and the trim little frigate seemed to heel right over under the crashing broadside which burst from the gaping ports. A moment later her topmen were swarming aloft to set her topsails and royals, and she strove to cross the Gloire's bows and rake her again. The French captain, however, brought his frigate's head round, and the two rode side by side within easy pistol-shot, pouring broadsides into each other in one of those murderous duels which, could they all be recorded, would mottle our charts with blood. In that heavy tropical air, with so faint a breeze, the smoke formed a thick bank round the two vessels, from which the topmasts only protruded. Neither could see anything of its enemy save the throbs of fire in the darkness, and the guns were sponged and trained and fired into a dense wall of vapour. On the poop and the forecastle the marines, in two little red lines, were pouring in their volleys, but neither they nor the seamen-gunners could see what effect their fire was having. Nor, indeed, could they tell how far they were suffering themselves, for, standing at a gun, one could but hazily see that upon the right and the left. But above the roar of the cannon came the sharper sound of the piping shot, the crashing of riven planks, and the occasional heavy thud as spar or block came hurtling on to the deck. The lieutenants paced up and down the line of guns, while Captain Johnson fanned the smoke away with his cocked-hat and peered eagerly out. "This is rare, Bobby!" said he, as the lieutenant joined him. Then, suddenly restraining himself, "What have we lost, Mr. Wharton?" "Our main topsail yard and our gaff, sir." "They'll think we've struck! Lash a boat's ensign on the starboard arm of the mizzen cross-jackyard." A round-shot dashed the binnacle to pieces between them. A second knocked two marines into a bloody, palpitating mash. For a moment the smoke rose, and the English captain saw that his adversary's heavier metal was producing a horrible effect. The Leda was a shattered wreck. Her deck was strewed with corpses. Several of her port-holes were knocked into one, and one of her eighteen-pounder guns had been thrown right back on to her breech, and pointed straight up to the sky. The thin line of marines still loaded and fired, but half the guns were silent, and their crews were piled thickly round them. "Stand by to repel boarders!" yelled the captain. "Cutlasses, lads, cutlasses!" roared Wharton. "Hold your volley till they touch!" cried the captain of marines. The huge loom of the Frenchman was seen bursting through the smoke. Thick clusters of boarders hung upon her sides and shrouds. A final broadside leapt from her ports, and the mainmast of the Leda, snapping short off a few feet above the deck, spun into the air and crashed down upon the port guns, killing ten men and putting the whole battery out of action. An instant later the two ships scraped together, and the starboard bower anchor of the Gloire caught the mizzen-chains of the Leda upon the port side. With a yell the black swarm of boarders steadied themselves for a spring. But their feet were never to reach that blood-stained deck. From somewhere there came a well-aimed whiff of grape, and another, and another. The English marines and seamen, waiting with cutlass and musket behind the silent guns, saw with amazement the dark masses thinning and shredding away. 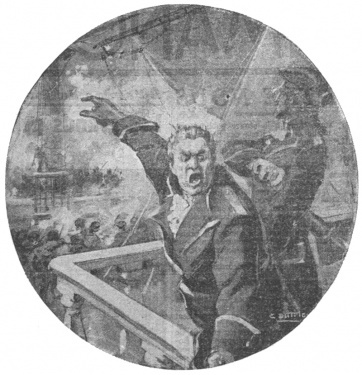 At the same time the port broadside of the Frenchman burst into a roar. "Clear away the wreck!" roared the captain. "What the devil are they firing at?" "Get the guns clear," panted the lieutenant. "We'll do them yet, boys!" The wreckage was torn and hacked and splintered until first one gun and then another roared into action again. The Frenchman's anchor had been cut away, and the Leda had worked herself free from that fatal hug. But now, suddenly, there was a scurry up the shrouds of the Gloire, and a hundred Englishmen were shouting themselves hoarse: "They're running! They're running! They're running!" And it was true. The Frenchman had ceased to fire, and was intent only upon clapping on every sail that he could carry. But that shouting hundred could not claim it all as their own. As the smoke cleared it was not difficult to see the reason. The ships had gained the mouth of the estuary during the fight, and there, about four miles out to sea, was the Leda's consort bearing down under full sail to the sound of the guns. Captain de Milon had done his part for one day, and presently the Gloire was drawing off swiftly to the north, while the Dido was bowling along at her skirts, rattling away with her bow-chasers, until a headland hid them both from view. But the Leda lay sorely stricken, with her mainmast gone, her bulwarks shattered, her mizzen-topmast and gaff shot away, her sails like a beggar's rags, and a hundred of her crew dead and wounded. Close beside her a mass of wreckage floated upon the waves. It was the stern-post of a mangled vessel, and across it, in white letters on a black ground, was painted, "The Slapping Sal." "By the Lord! it was the brig that saved us!" cried Mr. Wharton. "Hudson brought her into action with the Frenchman, and was blown out of the water by a broadside!" The little captain turned on his heel and paced up and down the deck. Already his crew were plugging the shot-holes, knotting and splicing and mending. When he came back, the lieutenant saw a softening of the stern lines about his eyes and mouth. "Every man. They must have sunk with the wreck." The two officers looked down at the sinister name, and at the stump of wreckage which floated in the discoloured water. Something black washed to and fro beside a splintered gaff and a tangle of halliards. It was the outrageous ensign, and near it a scarlet cap was floating. "He was a villain, but he was a Briton!" said the captain, at last. "He lived like a dog, but, by God, he died like a man!" This page was last edited on 19 June 2018, at 22:08.